The Worship & Faith DVD was recorded live at Calvary Assembly of God in Orlando, Florida on July 15, 2003. 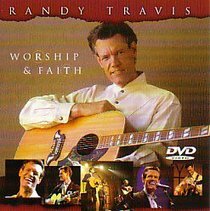 Over 4,000 people gathered to join Randy Travis & band for their rendering of worship songs and hymns from the Worship & Faith CD, plus "Three Wooden Crosses" and "Pray For The Fish" (both from the hit country album RISE AND SHINE). This extraordinary all-acoustic performance featured unique bluegrass/country arrangements of these well-known songs and Travis' unmistakable voice.